Under cross-examination, Israeli occupation official admits that because of the shortage of electricity in Gaza the sanitation pumps are not working at full capacity. The lawyer representing the Zaytouna-Oliva’s owner made full use of this opportunity to focus attention on the effects of the blockade. On November 12 in a court-room in Haifa, the head of the economics department of the Gaza coordination unit, Mr. Tzidki Maman, was cross-examined by Gaby Lasky, the lawyer representing the owner of the Women’s Boat to Gaza. She asked him whether the list of permitted (dual-use) items was updated after the latest reconciliation between Hamas and Fatah. He replied that the latest update was in December 2015, revealing that political changes do not affect the policy of the blockade – proving that the blockade is not a security measure. Lasky went on to ask about the electricity supplied by Israel to Gaza. The Israeli Occupation Forces (IOF) representative confirmed that Israel was currently supplying just 60% of what it used to. He admitted to knowing that this was causing the use of generators especially in the health and water supply sectors. According to him fuel supply is not restricted by the coordination unit, as all requests by the private sector to transfer fuel through Kerem Shalom / Karem Abu Salim are processed and admitted. When asked about the effects of lack of electricity on water supply, he admitted that more water is allowed in than before, and when confronted with the fact that this is due to the difficulty of pumping water without electricity he denied knowledge of it, according to him there is no lack of drinking water in Gaza. He admitted that due to lack of electricity the sewage treatment plants were not working at full capacity. Asked about the reconstruction of housing in Gaza, he replied that the 90 thousand units needed was a number correct two or three years ago. When told that more than 60% of reconstruction is still outstanding he said he was not aware of such statistics. When questioned by Lasky as to why exports from Gaza are approximately 2,500 trucks / year – much less than the export capacity of Gaza – he replied that there is no quantity limit, only security clearance issues. He claimed that producers in Gaza can export through Israel (Kerem Shalom/ Karem Abu Salim and the port in Ashdod) and that traditionally the export was mainly to the rest of historical Palestine and to Africa through Egypt. When questioned about the unemployment rate in Gaza, the IOF representative admitted it was 44%. He said that there are 5,000 active fishers in Gaza. When asked about the 200 fishing boats that had been confiscated by Israel in the last two years, he said that this sounded too high. The reasons for confiscation according to him were for fishers exceeding the permitted fishing zone or confronting the Israeli navy. He stated that the permitted fishing zone is 6nm in the north and 9nm in the south of the Strip and refused to acknowledge that this is more restricted than the naval blockade. When asked about the reduction in fisheries, he alleged ecological problems affecting Israel and Egypt as well. When asked if Palestinian or international engineers are permitted to enter Gaza to treat the problem of sea contamination, he said that he is not aware that any such requests to enter had been made. When asked whether he would approve a request to explore natural resources in the sea off the coast of Gaza (like gas or petrol) he denied having the authority or knowing who the authority would be. He admitted that without Israeli permission this would probably be impossible. When asked about fish farming in the Gaza sea he said that he is not aware of what permission is needed, but also admitted that he is involved in a process to establish fish farms in the Gaza sea in cooperation with the Food and Agricultural Organization (FAO). Regarding ecological concerns, he observed that such farms have been closed in the Red Sea, but still exist in the Mediterranean Sea. When asked about sanitation in Gaza, he replied that he is aware of no specific problem. He did not know the extent of recycling in Gaza, although he knew that there is some re-use of rubble from destroyed buildings. He said that he was not aware of a current list of food items that are not allowed to be brought into Gaza. When asked about the need to ask for permission to leave Gaza, he admitted that requests to leave for commercial reasons require 70 days notice, whilst humanitarian and health reasons may be require less time. He admitted that there are fewer permissions given to leave, but denied that there was a policy to reduce the number of permissions given. He claimed that the reduction in permissions is due to security reasons and that it does not affect the general situation in Gaza. He denied knowledge of refusal to allow World Health Organization personnel entry into Gaza. He admitted that there is much activity of international humanitarian aid organizations in Gaza and that the reason they are needed is to bridge the gaps among the needier parts of the population especially in health and food supply issues. 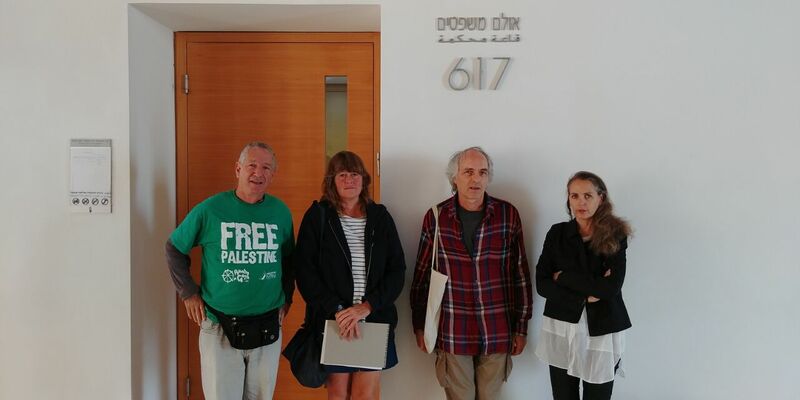 The Freedom Flotilla Coalition continues to use these court hearings not only to contest the seizure of the Zaytouna-Oliva but also to highlight the issue of fishing boats from Gaza which are regularly confiscated by Israeli naval forces and held in Israel, thus denying Palestinian fishers their right to earn a living. The next hearing for witnesses in the Zaytouna-Oliva confiscation case in the maritime court is scheduled for January 30.